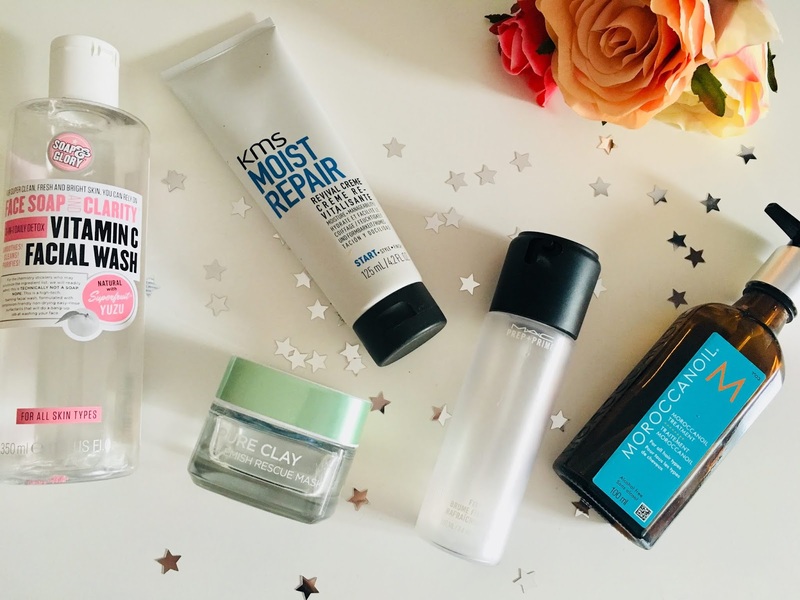 I'm back again with the 4th edition of my 2018 Product Empties series. I can't believe this is the 4th empties post I've done so far! 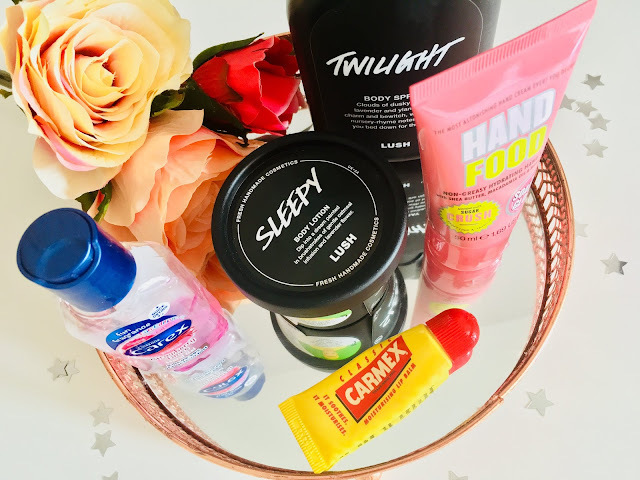 I've managed to accumulate a good variety of products to share with you all and let you know if I enjoyed using them and if I would consider purchasing them again. 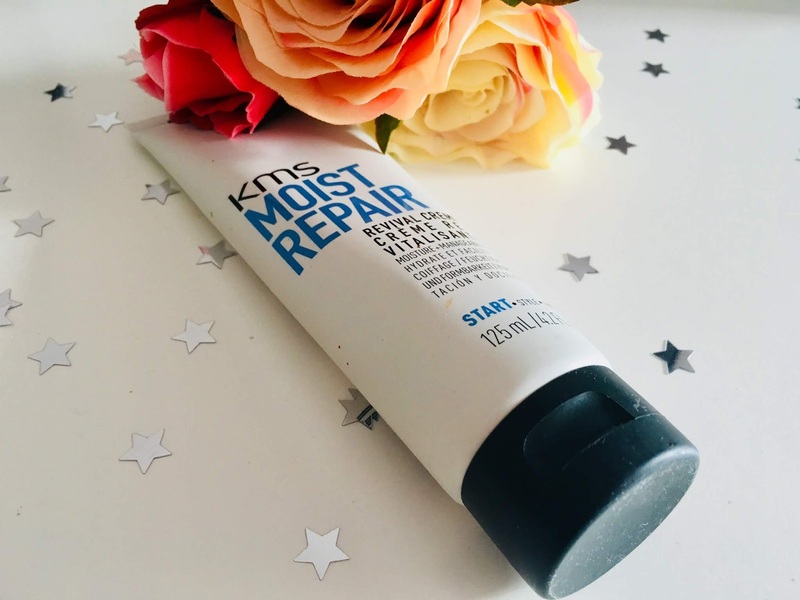 The first empty I have is the KMS Moist Repair Revival Creme. This was a product which was recommended to me by my hairdresser as I have had my hair balayaged a few times in the last few years. This product works to retain and inject moisture into your hair to prevent it from drying out. You apply it to wet hair before blow drying, and it really does help to keep your hair feeling hydrated. I also really love the scent, it really reminds me of a hot summers day! 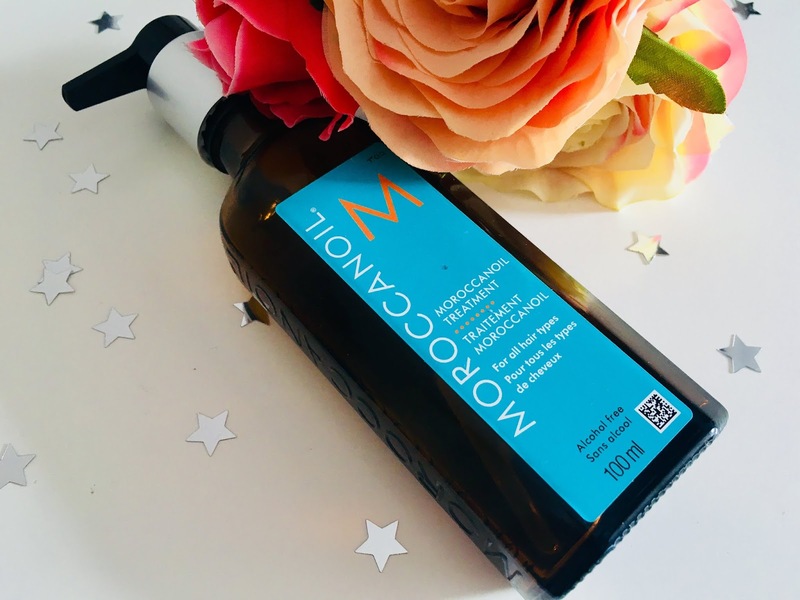 Next up is MoroccanOil. I adore this! I've been using MoroccanOil continuously for the last five years, it's an absolute holy grail product for me, just because of the amazing benefits it gives to my hair whenever I use it. My hair looks and feels so healthy, it looks silky and smooth, not to mention that the scent of MoroccanOil is divine! I rate this product very highly! Would I Re-Purchase? Of Course! I've also recently finished up using the L'Oreal Blemish Rescue Clay Mask. I really enjoyed using this face mask, and I really did notice a difference to my skin whenever I used it. Especially if I was experiencing a break out. This mask helped to calm down any blemishes I had, and prevented any blemishes from appearing. The scent of this product is hard to describe, however, it is refreshing. The only downside for me, is that I found it a little messy getting the product out of the jar and would much prefer a squeezy tube. 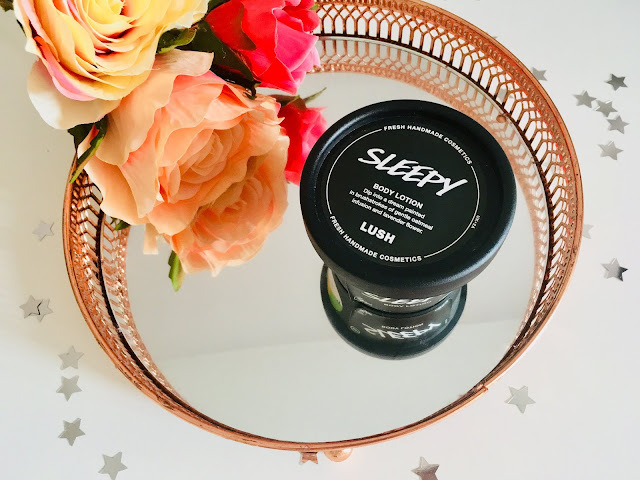 I'm so gutted that I've finally used up my tub of the Lush Sleepy Body Lotion! However, it gives me an excuse to buy another tub of it! I was a bit sceptical of this product at first, with all the rave about it, I wasn't sure if it was all too good to be true, but it's legit! I just love the scent of this body lotion, it really does make you feel all relaxed and ready for a good nights sleep, but it also makes your skin feel amazing at the same time, making you feel amazing when you wake up in the morning. I highly recommend this! I've also recently used up the MAC Prep + Prime Fix + Spray. 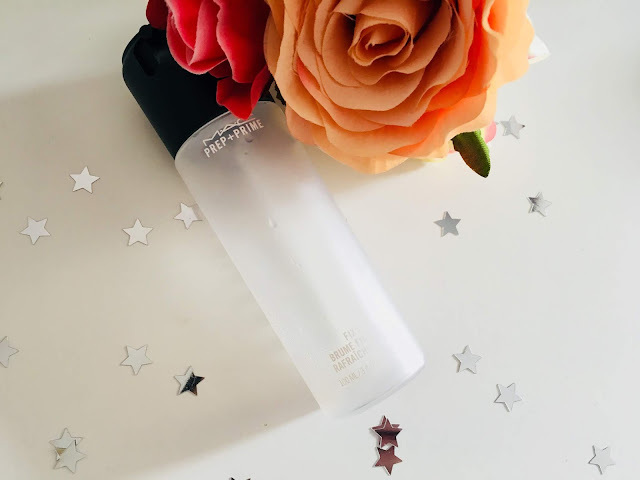 I really enjoyed using it, and it made my makeup last so much longer than what it would normally last without the spray. I tended to use this after I had finished doing my base makeup, and before I did my eye makeup. It's such a hydrating mist as well, and can used on your skin prior to applying any makeup as well. 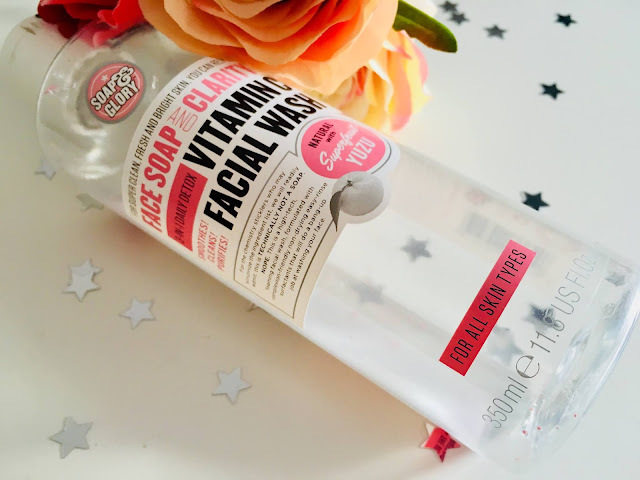 Lastly in this edition of my Product Empties series is the Soap & Glory Face Soap & Clarity 3-in-1 Daily Vitamin C Facial Wash. I got this as part of a Soap & Glory Christmas gift set, and have just finished using it. This is such a refreshing facial wash, and the beads that are in there work as a exfoliant, so this is a great multi-tasker. It always leaves my skin feeling so clean and soft, and looking amazing! I've always found it really hard to implement and maintain a skincare routine, doing just the bare minimum to get by. But as I'm getting older, I realise how important it is to look after my skin and make sure that it's looking as fresh as possible. I'm going to go through with you all the products I use on a daily basis. In the morning, I keep my skincare really simple. I use a cotton pad with a splash of Garnier's Micellar Water, and just wipe away any dirt or oils that may have surfaced during the night. I then apply the Nivea Soft Moisturising Cream to my face, and apply some of the La Roche Posay Anthelios SPF before applying my makeup for the day if I am wearing it. My skincare routine really comes into life in the evening, and if I have worn makeup that day, I'll start by removing my eye makeup with some Garnier Micellar Water on a cotton pad. Once I have done that, I'll use a small amount of the Clinique Take The Day Off Balm and really work it into my skin to lift up the rest of my makeup that's on my face. 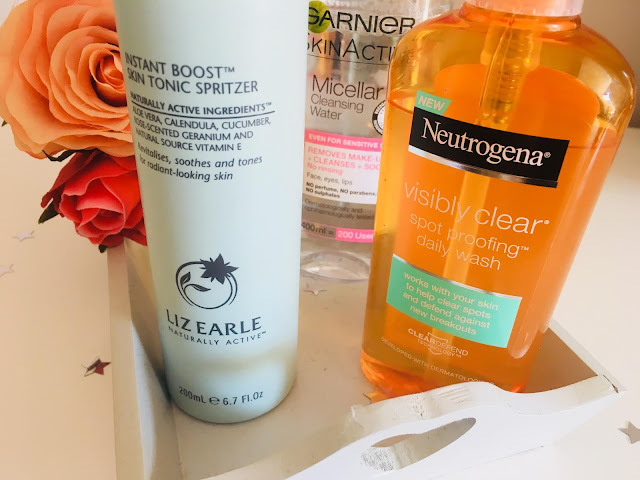 Using a clean cloth, I'll wipe away the all the makeup off my face, and then I proceed to double cleanse my skin with the Neutrogena Visibly Clear Spot Profing Daily Wash. This is a fairly recent addition to my skincare routine, and I have fallen in love with it! It really helps to keep spots at bay, and if you already do have spots, it helps to clear them up. There are a few nights in the week where I use additional products in my skincare routine. The first being the Lush Kiss Lip Scrub. This was from their Valentine's Day range earlier on in the year, and I just love using it! It smells, and tastes good, but it really makes my lips feel super smooth and brand new! I tend to use this a couple of nights a week. 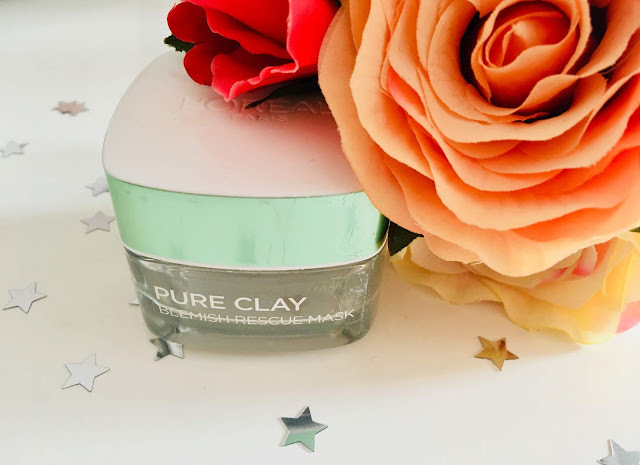 I also use a face mask twice a week too, I like to use the GLAMGLOW Supermud Clearing Treatment Mask for one of the mask nights, and Beauty Formulas Rejuvenating Glorious Mud Facial Mask for the other mask night. I'm not currently using a exfoliant, I had been using a scrub, but I feel that they're too rough on my skin. I'm considering purchasing and incorporating the Pixi Glow Tonic into my skincare routine very soon - let me know your thoughts?! Once my skin is all clean, I like to put some hydration back into my skin. I start by misting the Liz Earle Instant Boost over my skin and letting that sink in for at least a minute or two. I then apply the Origins Gin Zing Gel Moisturiser, which is one of my all time favourite moisturisers! I love the scent, and it really refreshes my skin. 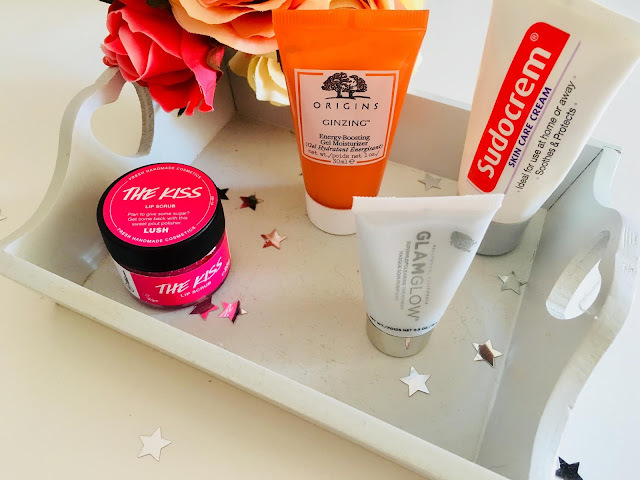 Once all my moisturiser is worked into my skin, I apply some of the Sudocrem Skin Care Cream to any blemishes/spots or problem areas on my face. Finally, I finish up with some Carmex Lip Balm on my lips! Let me know what skincare products you're currently loving! I don't know about anyone else, but for me, having a bedtime routine is so important in making sure you get a good nights sleep and wake up feeling refreshed. It's a time to revitalise, relax, and unwind! There's a few products that I keep beside my bed in order to achieve this. As soon as I step into my bedroom at night, one of the first things that I like to do is spray some of the Lush Twilight Body Spray over my pillows and bedding. Although it is a body spray, you can use it to ensure your bedding smells heavenly! I find that a couple of spritzes of the spray lasts me at least a couple of nights, so you don't have to use too much of it at all! The lavender scent is amazing for relaxing and ensuring you have a top quality sleep! I also like to smother myself in the Lush Sleepy Body Lotion before I get into bed. This is the exact same scent as the Twilight body spray, as it is part of the same range of products from Lush. I love how moisturising this body lotion is, and the scent of this makes me feel so relaxed and, as the name suggests, sleepy! 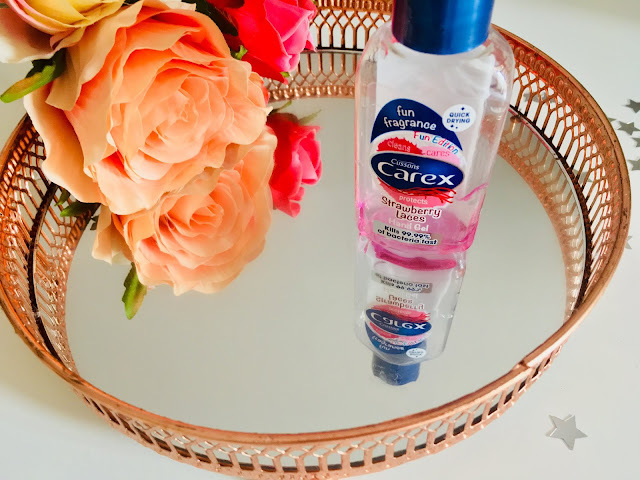 When I have used this, I wake up feeling so refreshes after having an amazing nights sleep, and my skin feels so incredibly soft and hydrated too! I like to keep a hand sanitizer beside my bed. In fact, I tend to keep them everywhere! One of my favourites, and the one which I currently have beside my bed is Carex Strawberry Laces. This smells amazing, just like the real thing! Carex have so many amazing scented hand soaps, it's so hard to pick a favourite! Bedtime is a great time to make sure that I'm applying some hand lotion too! 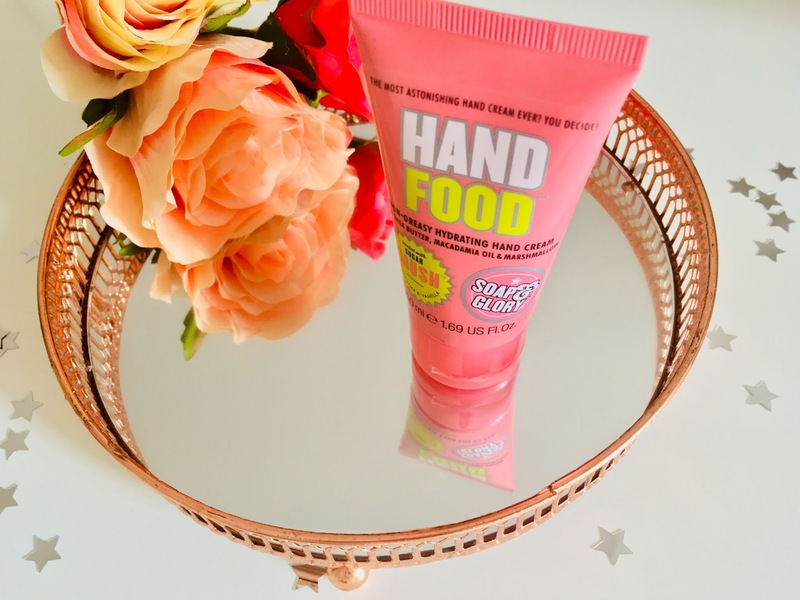 My all time favourite hand lotion is Soap & Glory Hand Food! Currently, I'm using the Sugar Crush scented Hand Food which Soap & Glory very kindly sent me as part of their #babesofglory campaign. I adore the scent of Sugar Crush, and am very pleased to see it in the Hand Food format! And then lastly, I like to make sure that my lips are hydrated before I head off to sleep. 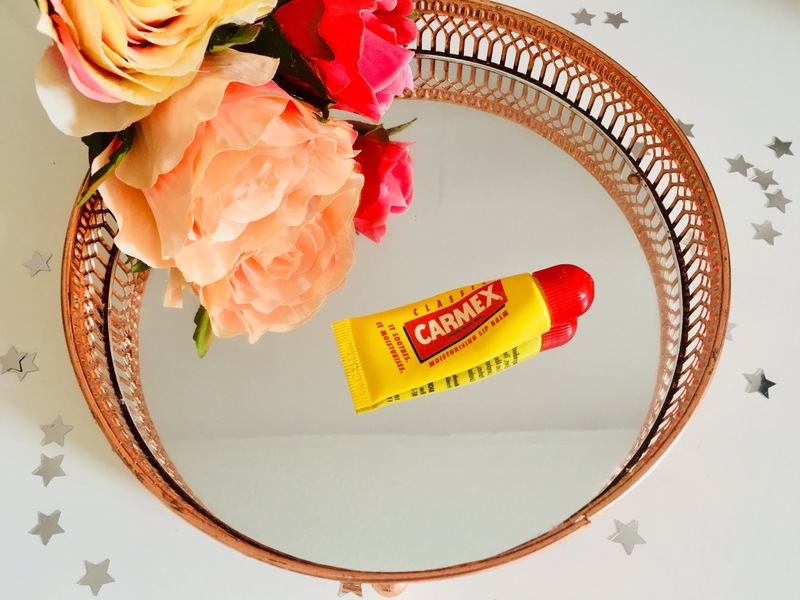 I like to use the Carmex Lip Balm on my lips, but in the tube format. I much prefer the tube to the tub! There isn't any other lip balm that I like to use more than Carmex, I love the sensation on my lips when I apply it, it leaves my lips feeling smooth, and, I like the scent/taste of it! It's an all round winner for me! Hello August! The start of a new month always means one thing for my blog - a new beauty wishlist! As always, I'm going to give you the low-down on the products which I am loving the look of this month! The first product on this months wishlist is the Sally Hansen Gel Rehab. I love having gel polish on my nails, but it really dries out, and damages my nails. This product looks as though it injects some goodness back into your nails after wearing gel polish. I think this is a product that I would really welcome into my nail care routine! The next product on my wishlist is the Lush Sleepy Body Lotion. I bought a small tub of this towards the end of last year to try it out as there had been so much hype surrounding it. Having now used up all of the tub, I can see why there was so much build up around it! After every night that I had applied it before getting into bed, I had woken up feeling much more refreshed and had a good quality sleep the next morning. Normally when things are hyped, I always wonder if it's a gimmick, but this body lotion is the real deal! I highly recommend it, and definitely need to stock up! I have also included the Garnier Moisture Bomb Eye Tissue Mask. I'm loving the look of eye masks recently, and to find a cheaper alternative on the market is great! These eye masks look really refreshing and great for the skin, so I'd be really interested to see what effect they have. I have added the YSL Black Opium Click & Go to my wishlist in August. Black Opium is one of my all time favourite fragrances, so to find out that there is a more portable version of the perfume is great! It looks perfect to pop in a bag, and to top up the scent first put on the morning, throughout the day. 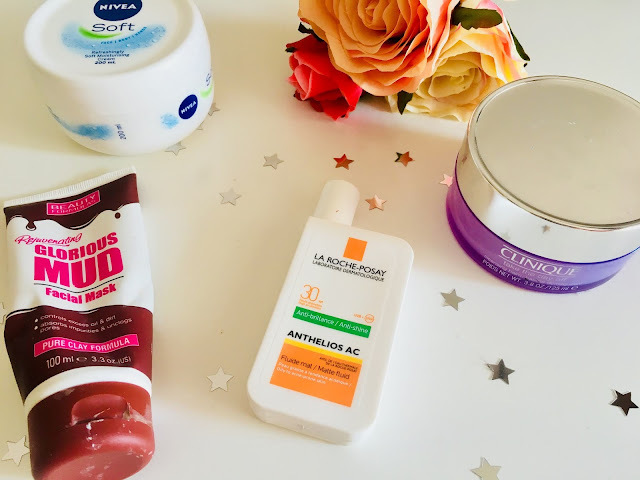 I've seen a lot of good reviews for the Embryolisse Lait Creme Concentré, so this is another product that I would love to try! It looks so hydrating on the skin, and that's one thing that's important in my skincare regime - hydration. This also looks like a good product for priming the skin before applying makeup. Next is quite a fun product! It's the Imperial Leather Refreshers Shower Gel! Imperial Leather have quite a lot of unique scented shower gels on the market, and I just love that they've created a shower gel scented with a retro sweet! I can imagine that this will be a 'refreshing' shower gel to use and will leave you feeling extremely clean! I've also been really into false lashes lately, nothing over the top, just something natural to enhance and elongate my actual eyelashes. I love the look of the Ardell Wispies Lashes. They look so natural, and seem to blend effortlessly into the lashline. 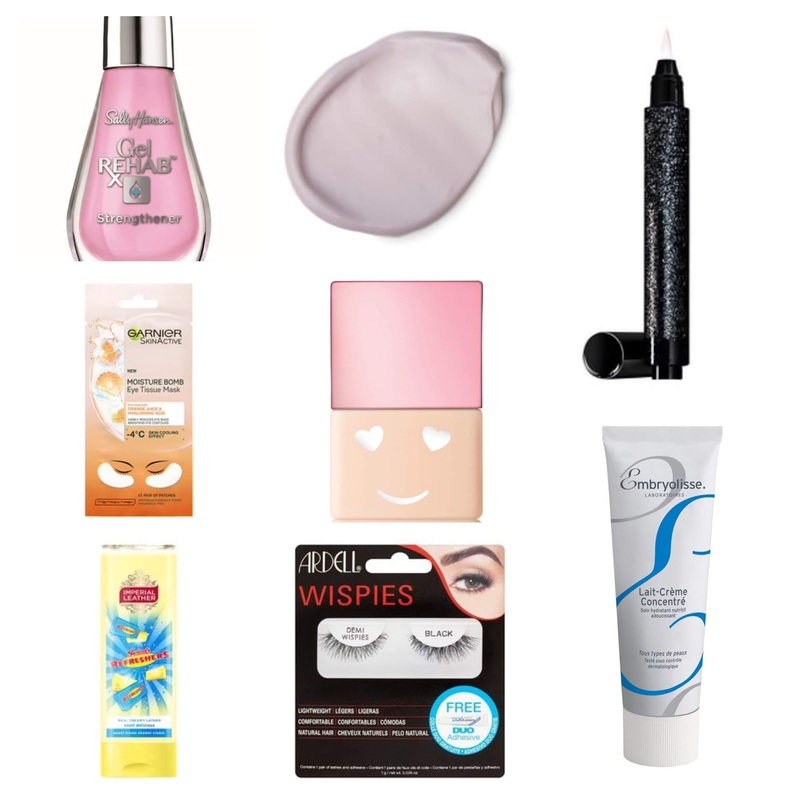 Lastly, on my wishlist is the Benefit Hello Happy Foundation. I'm going to admit, it's the packaging of this product which has sold me - it's adorable! I have no need for a new foundation at the moment, but maybe it's one to look at in the future?